If you live anywhere near Santa Cruz, and especially the Aptos Beach area, you know that the humpback whales have been stealing the show lately. They have been feeding off anchovies and can grow up to 40-60 feet long and weigh as much as 44 tons. I have seen them as little as 150 feet just offshore outside the shore break. Since I live within a couple of minutes of Aptos Beach I have had many opportunities to observe and photograph them. One of their feeding behaviors is to come up beneath a school of anchovies, mouth wide open, and lunge to the surface scooping up the prey. You can see in the images the anchovies spilling from the whale's mouth. Another behavior is called "bubblenet" feeding. Several whales circle the anchovies and corral them by blowing bubbles forcing the food into a tighter ball. 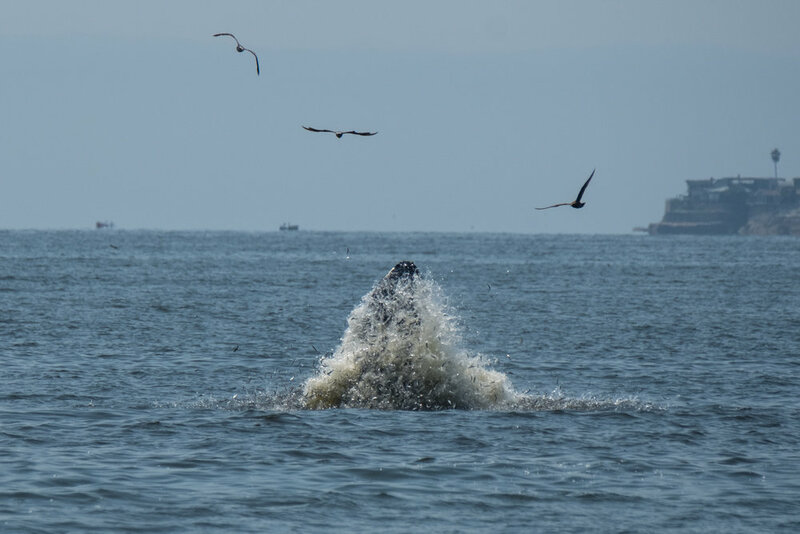 Then you may see two or more whales lunging through the bait ball. A couple of my images have captured that behavior. I don't consider myself a wildlife photographer. However as a professional I believe I should be able to handle almost any scene photographically. If I were on a boat I probably could have gotten closer shots. Certainly there are some awesome images made by local photographers. However, viewing them from so close to the shore (practically from my own backyard) was a special experience. Now for the technical information. A Fuji XT2 camera with a 100-400 zoom lens with image stabilization was used to make these images. Always be looking in the viewfinder anticipating where the next appearance may occur. Follow the birds - especially the ones near the last lunging whale. See if you can get the shutter speed up to 1/1000 sec. or more, adjusting the aperture and iso sensitivity as necessary. Set the motor drive (frames per second) to as fast as it will go. My XT2 can shoot 8 frames per second. And if you are using an iPhone - well, good luck!